GB: To start off, can you tell us a bit about how you got started in the modeling industry and how long you've been involved with it? Erin: My mom's a photographer...I grew up having my picture taken. She'd always drag me into the studio for test shoots with a new lens or camera. I'd hear a lot of 'you should model' comments from friends and family, too...and living in L.A., when these elements come together, you inevitably wind up in the industry on some level. I didn't begin to seriously pursue modeling and expand on my portfolio until recently, however...within the last couple of years. 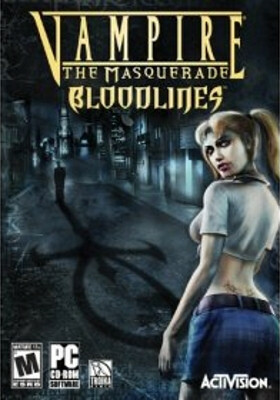 GB: How did you become aware of a modeling job for Vampire: The Masquerade - Bloodlines? Was it something you were actively pursuing or did it find you? Erin: I came across the opportunity fortuitously, during a random conversation with Activision's PR guy, Shane DeFreest. After some geeky chat about the World of Darkness, he found my picture page and instantly made the connection, forwarding my image to the Bloodlines production people. GB: What was your reaction when you realized you were going to portray a Malkavian vampire? Did you have you to do some research into the Malkavian clan to help get the right look, or were you already pretty familiar with the V:tM setting? Erin: No research on the Malkavian clan required. I was familiar with them through my own experiences with Vampire, and the first PC game. Dev_Null rocks. *Grin. * I studied the concept art for Jeanette to get a better feel for her, and the right look as far as the costume went. But other than that, I'd say it came naturally...heh. GB: What was it like working with Tim Bradstreet? How would you compare him to other artists you've worked with? Erin: Fun. Easy. Comfortable. Tim's like a gaming buddy...geeky, friendly and quick with sarcastic wit. His work environment is casual, and his wife and dogs are great. Was sorry I missed jumping on the giant trampoline in the back yard. Often, other artists and photographers will have a very formal setup in their studios...some seem to take themselves too seriously, which only adds tension to any shoot. GB: Can you give us an idea of the work that goes into doing a shoot like the one for Bloodlines? Is it a multi-day process? Erin: The shoot with Tim took one day. We were probably on the road down to San Diego and back longer than we were actually at his place. Time in front of the camera was roughly half an hour or so...which allowed us to capture as many poses and moods as necessary, cover all the bases. GB: There are two main poses for Jeanette - one for the box cover and one for the promotional items (posters, t-shirts, etc). How did these poses differ and what sort of mood were you asked to convey for each? Erin: The pose for the box cover is the key art Activision chose early on. It has something of an alluring and mysterious mood to it. For the poster, I wasn't asked to convey anything in particular, but in the end, the image that was chosen was something even darker and fairly sinister, which Bradstreet's style seems best suited to. Definitely the wicked side of Jeanette. GB: Was the decision for Jeanette's final "look" up to Tim alone? Or was it a collaboration of people that decided on which artwork to use? Were you able to provide some input into the final decision as well? Erin: I was able to see the photographs, but did not have any say. Tim forwarded the images to Activision, who decided which they wanted to use, and Tim took over from there.